As a precautionary measure, the Fishery Federal Council (CFP) will establish a 2,500-tonnes maximum allowable catch (MAC) on toothfish (Dissostichus eleginoides) for the current year. Rising demand for seafood and other marine produce will lead to a collapse of today's commercial fish stocks by 2050 unless better management is introduced, exemplifying the challenges facing Governments in a globalized world, according to a new United Nations report released Monday. The University of Los Lagos (ULA) is planning to build the first Fish Farming Park in Chile on a 5.5-hectare terrain, in the Tongoy Bay of Coquimbo Region IV, investing more than CLP 450 million (USD 826.400). An anti-whaling group patrolling the Ross Sea off Antarctica is offering a 25.000 US dollars reward to any person or group that can provide coordinates of the Japanese whaling fleet operating in the area. The Falkland Islands is celebrating the twentieth anniversary of the introduction of the Fisheries Conservation Zone with a special commemorative stamp issue and the release of an allusive coin. All crewmembers of an Argentine fishing vessel which caught fire and was abandoned early Friday morning off the coast of Santa Cruz province, north of the Falkland Islands have been rescued, reports the Argentine Coast Guard. A significant drop in the South Atlantic common hake (Merluccius hubbsi) breeding biomass and other alarming signals were collected in the latest report from Argentina's National Institute for Fisheries Research and Development, INIDEP, particularly in an area north of parallel 41 S.
The Uruguayan flagged scallop trawler Holberg which ran aground in the Falkland Islands and was later re-floated by a team of divers from the Uruguayan Navy finally arrived in Montevideo over the weekend, towed by the Mariana Rojamar II. 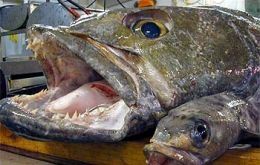 The southern stocks of Argentine hake (Mercluccius hubbsi) are in fragile biological balance which will have a negative impact on catches this year and even more in 2008. 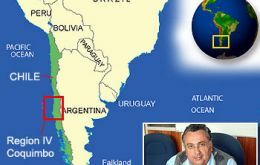 Headlines: Punta Arenas casino operacional in 2009; BHP Billiton interested in Magallanes coal deposits; State of the art sheep abattoir; Spain's major Antarctic research expedition; Fidel Castro Junior visits Chilean fiords; Reediting Darwin's voyage of the Beagle.